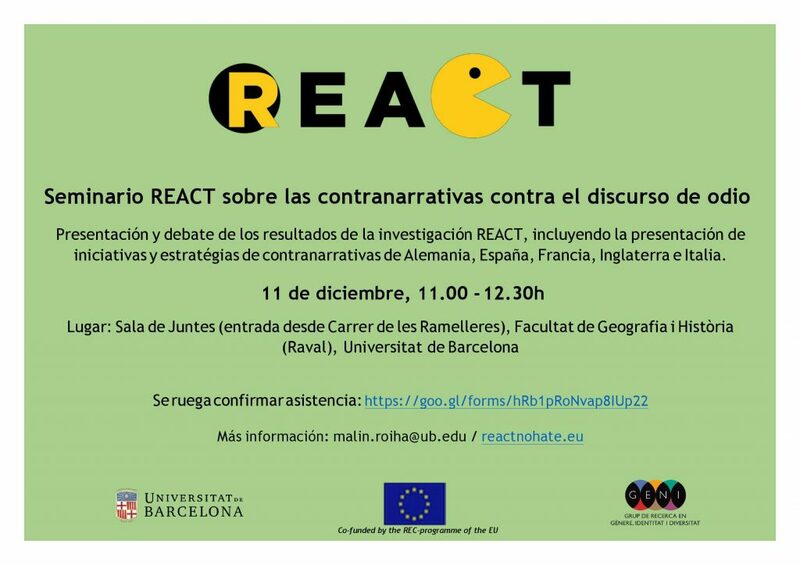 The European Social Research Unit (ESRU) organises the Seminar #REACT ‘Las contranarrativas contra el discurso de odio’ for the project REACT co-financed by the Rights, Equality and Citizenship Programme (REC) of the EU. The seminar will take place on the 11th of December at the Sala de Juntes of the Faculty of Geography and History of the UB, from 11h to 12h30. It will present the results of the qualitative research and debate the transferability of counternarrative initiatives gathered during fieldwork in different EU countries. The seminar will be led by Malin Roiha with the participation of activists, media and organisations against discrimination. This entry was posted in Uncategorized @ca and tagged hate speech, malin roiha, no hate, online, react. This entry was posted in Events, News and tagged hate speech, malin roiha, no hate, online hate speech, REACT.